The design was technically complex as the existing roof involved a cable net structure with a tension ring, from which steel roof rafters hung. The structural integrity of the existing tension ring relies on it running around the whole circumference of the roof; therefore any modification to the roof could not affect this, even in areas where roof rafters were removed. Protection of the existing cable was vital as there was no repair procedure in place and damage would result in replacement and potentially the closure of the stadium for two years. Extensive design optimisation exercises were undertaken, particularly for the steel roof and the stability cores. A whole series of geometric studies evaluated the effects of different stay and mast angles, concluding with a solution to satisfy both minimum material requirements and cost. The stability cores were formed of steel vertical brace planes with the inclusion of outrigger bracing to add efficiency and, although a solution normally adopted on tall buildings, this approach proved effective for the project. A design and costing study of the original stays, which were formed of cable, revealed that bars could be introduced for the new stays. These had marginally more erection work associated with them, but overall were a more efficient solution. Combined 3D modelling allowed the integration of all services within the structural envelope, including the late addition of increased sports lighting requirements in accordance with new regulations. The ‘interim roof’ solution involved cutting and removing the existing back of the roof, acknowledging that this meant cutting into roof rafters which had significant locked-in forces from the dead loading of the roof. 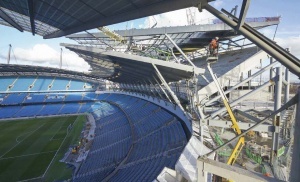 Significant and complex temporary works were required for the project, with the remodelling of the existing roof completed in the first closed season, alongside temporary propping to allow work to proceed above the existing roof. The existing roof was removed in the second closed season to reveal the new terrace behind. 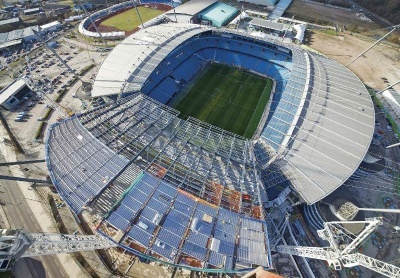 The new design respects the geometry of the existing stadium and, whilst the expanded South Stand is significantly larger than the previous one, blends into the original design. In terms of sustainability the project focussed on re-use and recycling, rather than demolition. The team worked exceptionally hard to retain the existing cable net that supports the stadium roof. Much of the original building was retained during construction and existing components from the building’s façade re-used. Steel and aluminium crowd ‘flood gates’ were cleaned, repaired and repainted and the existing lower tier terracing was re-used, following careful detailing with the connection to the new building. 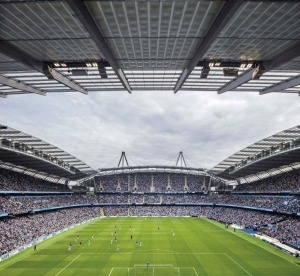 The client also received a masterplan design which enables the stadium capacity to be expanded further to the absolute limit of the existing cable net and then, only at that point, does the roof need to be completely replaced.